Firstly, it’s not change for the sake of change. That said, change is inevitable, and something to be embraced, etc. etc., but that’s not a good enough reason to change a logo. A good reason to change a logo is that it’s not doing the job you want it to do—and because a simpler, more distinctive evolution of it could do that job better. Our first logo was created before the company launched. It was distinctive, and playful, and the octothorpe (or pound sign, or hash, or whatever name by which you know it) resembled the same character that you see in front of channels in our product. We developed different versions of the logo to compensate, which worked well for different purposes. But that meant that every app button looked different, and each one in turn was different from the logo. Many beautiful things—but without a sense of cohesion that you might expect. So here we are. Our in-house design and brand team, together with Michael Bierut and the team from Pentagram, worked to create a new and more cohesive visual identity. And we’re starting, today, with the logo. It uses a simpler color palette and, we believe, is more refined, but still contains the spirit of the original. It’s an evolution, and one that can scale easily, and work better, in many more places. 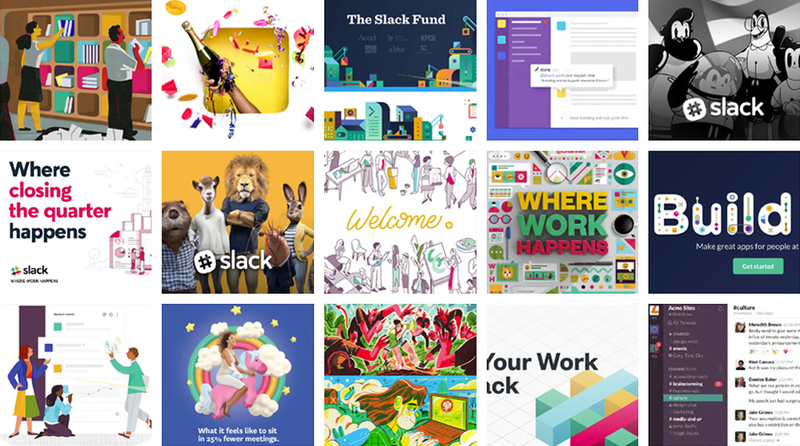 Over the next few months, you’ll see all the other visuals around Slack aligning around this new direction: on the website, in advertising, and in some places in the product (though not in a way that will keep you from the important business of getting things done, of course). It’s still us. We’re still Slack. But more consistent and, we hope, more instantly recognizable. TL;DR: We changed the logo. If you’d like to learn more about the design from Pentagram themselves, read their blog post here.